A smart, touching novel about the intimate yet fragile relationships among five very different people, thrown together in a small medical office, and how each life affects the others. Alicia, Brice, and Caroline are the ABCs-three close friends who have been brought together while working at the cozy medical practice of Drs. Markowitz and Strub in Midburg, Ohio. But when Alicia and Dr. Strub begin an affair, a dramatic chain of events ensues that gradually but drastically alters the office environment-ultimately requiring all five coworkers to redefine their relationships to one another. As Dr. Strub's romantic life is thrown into turmoil, Dr. Markowitz is faced with the dire illness of his own wife and the secret life she has kept from him. Nurse Alicia withdraws to focus on her prodigy son; receptionist Caroline enters into a strange romance she previously would have dismissed; and office manager Brice, his once-ordered world disintegrating, is set dangerously adrift. Finally, a questionable business venture that evolves into financial scandal precipitates a monstrous tragedy that threatens to destroy everyone involved. Read an Excerpt from The Office of Desire. Reading Guide / Discussion Questions for The Office of Desire. I wanted to write a novel about yearning, which this book is, but what startled me as I worked on it was how much grief kept flooding in. Maybe that's not surprising. As Hap says to Caroline: What is grief but desire in reverse? Tantor Audiobooks is producing an audio version of The Office of Desire, with Renee Raudman as Caroline and Todd McLaren as Hap. This is a dream come true for me. My sons and husband and I listen to audiobooks all the time in the car. We tend to avoid ones read by the author. "Even as her characters make disastrous mistakes, Moody, a genuinely original voice, takes an unsentimental approach that never denies life's possibilities. A provocative, intensely moving novel of ideas and opposing philosophies presented by deeply flawed, deeply human characters." " . . . the novel incorporates a lot of themes—explorations of faith, organized religion, sexual orientation, money, madness, death, and love—but Moody, a practicing physician, never loses control of the plot or her well-drawn characters; her details of medical life and caring for dying patients and loved ones resonate with truth." 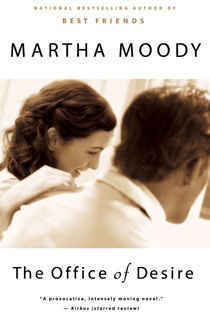 "Moody stages this sharply observed tale of office relationships gone very wrong at a small Ohio medical practice. . . . Moody keeps things moving . . . and gets the details right, whether adding up emotional balances, Prozac samples or a patient's bill."